Healthy Pumpkin Cookies | Pinwheel Cookies! With fall time in full kick, pumpkins and pumpkin recipes will be ubiquitous, including these Healthy Pumpkin Cookies! Truth be told, seasons come and go, but pumpkin cookies are always delicious to have around so no matter what time of year, you should put these cookies on your to-do list. These are the perfect breakfast, snack or dessert time cookie and pair great with coffee or a glass of almond milk! Watch me make them below. The Art Of Pinwheel Cookies! This was our first time attempting pinwheels, and now looking back, we definitely should have made these a lot sooner. You should know, however, making pinwheel cookies is an art and requires longer than usual. After you make the dough and fill it with your desired filling, pumpkin being the filling of choice in this recipe, you roll it up and freeze it for a minimum of 4 hours. We know waiting isn't fun, but it allows these cookies to be possible! What makes these fall dessert cookies? The pumpkin of course! But, fall doesn't only mean pumpkin - it means pecan pie, snickerdoodle cookies and hearty, bacon apple pork chops! When the cold seasons start to roll in we all look for warm and comforting foods, and dessert fits both of those boxes! We have recipes for all seasons, but desserts fitting for the fall season are the best kind. No matter the time of year, health cookies are always in season, especially when they are made with pumpkin! A couple tips about these cookies is that the freezing is extremely important. This prevents the cookies from breaking apart when you cut them prior to baking. Also, something to note is that the longer they cool for the harder they get. We found that the cookies peaked hardness the following day, which is how we like them. So, if you are taking these to an party or dinner, it would be a good idea to make them a day in advance! If you are struggling to decide what to make for your next holiday party, give these healthy pumpkin cookies a try! Note: Flours vary brand to brand so when making your cookie dough you want to be able to roll it out without it being to sticky or crumbly. 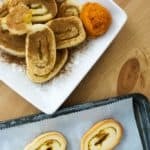 Recipe can be quickly added to MyFitnessPal - Search "KetoConnect - Pumpkin Pinwheels"
Healthy Pumpkin Cookies | Pinwheels! Combine room temperature butter and cream cheese in a bowl using a hand mixer. Add the erythritol and the vanilla extract, and combine once more. In a separate bowl combine the coconut and almond flour and add it to the wet mixture in two parts using the hand mixer to combine. Dough should be easily morphed with hands - not too wet or too crumbly. Pour the dough onto parchment paper. Cover with another piece of parchment paper and roll it out flat and even to create a rectangle. Spread the pumpkin filling over the surface of the flattened dough leaving the edge (about an inch) furthest from you clean of any filling. With the clean edge facing away roll the dough in a circle, using the parchment paper to guide the roll. Ba carrful as to not crack the dough too much as it rolls. Once the dough is in pinwheel formation wrap the parchment paper around it and place it in the fridge for two to 4 hours. Note: Four is best so the cookies don't split when you cut the dough. After four hours have passed, remove the dough and cut it into cookies about 1/2 an inch thick. Place them all onto a baking sheet on parchment paper (they will not spread in the oven) and bake at 350 degrees for 18 minutes. Allow them to set for at least an hour, but our favorite way to make them is a day in advance! Enjoy! Note: We were able to make 24 cookies out of our dough! They will last in the fridge up to one week.